AVCHD Video Converter is best AVCHD converter software supports convert AVCHD to AVI, AVCHD to WMV, AVCHD to MP4, AVCHD to MPEG, etc. most known video file formats. Support also burn AVCHD to DVD and watch it on your DVD Player. The AVCHD converter enables you to enjoy high definition video on your PC, iPod, iPhone, PSP, Zen, PS3 (HD support), XBox (HD support), Archos, phones, DVD/MPEG-4 players (with DivX/Xvid support) and portable media playes. HD Video (inc. AVCHD, MPEG-2 HD and WMV HD), TOD, MOD, M2TS, AVI (DivX, Xvid, etc. ), MP4 (inc. Sony PSP and Apple iPod), WMV, 3GP, QuickTime (MOV, QT), SWF, DVD, VOB, VRO, MPEG-1, 2, 4, H.263, H.264, Real Video, DVR-MS, MKV, FLV. Key HD-Formats are supported: AVCHD, MPEG-2 HD, WMV HD, TOD, MOD, M2TS, M2T, MTS, HDV. Edit, split, trim HD-videos, add text & effects and convert them to DVD or any other supported video format. Burn a DVD-disc and watch it on your DVD-Player. from video files of all supported formats. Use DVD menu templates. Split your movie into chapters. Watch them on your home DVD player. iPod, iPhone, PSP, Zen, PS3 (HD support), XBox (HD support), Archos, phones, DVD/MPEG-4 players (with DivX/Xvid support) and portable media playes. Copy videos and home DVDs to hard drive. Convert several video files at once. Join several video files and make one DVD. AVCHD Converetr fo Mac is an excellent Free Mac AVCHD converter software which can convert AVCHD to AVI, convert AVCHD to MPEG, convert AVCHD to WMV, convert AVCHD to MP4, etc. for Mac OS with perfect output quality and high conversion speed. 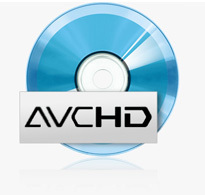 AVCHD (Advanced Video Codec High Definition) is a high-definition and standard-definition recording format for use in digital tapeless camcorders. The format is comparable to other handheld video camera recording formats, particularly TOD, and HDV.